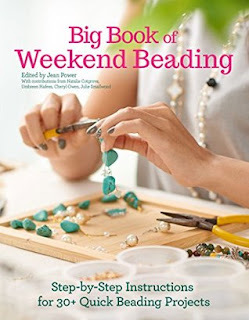 This is a great book for everyone, beginners and seasoned beaders as well. The first part of the book explains beading in full. Everything from tools, types, tips, materials and more. Then you get over 30 projects with step by step easy to follow instructions. The projects in the book are great for jewelry, clothing, and more. All of the projects are made to be complete over a weekend. I love all of the different beading projects. Some are made from string and small beads some are large beads and wire. The book is great to make projects as listed or you can even add your own twists to the project. These projects are great for making and giving as gifts as well.